The leader of the changelings and the antagonist of the two-part finale "A Canterlot Wedding." She resembles ponies that have both a unicorn horn and pegasus wings, but instead has a twisted horn and translucent insect wings in its place respectively. 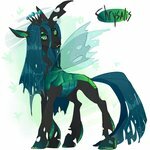 The following tags are aliased to this tag: chrysalis, qc.